Welcome to the first part of our HTC One M9 Troubleshooting series. We will be providing free support to all One M9 users starting today. So, if you are one of the owners of this wonderful phone by HTC, you are free to contact us any time. Our troubleshooting series will have many parts and for each part, we will address ten problems and their respective solutions. The issues I cited in this post are the ones reported to us by our readers. Based on the number of emails we received, the most common is the overheating issue that’s why it’s the first one on the list. If you are experiencing this problem, try to see if there is an available update for your device as HTC rolled out an update that reportedly addressed the problem. The second problem I cited is actually just a glitch but it seems there were many users who complained about it. The good thing is it can easily be fixed and there’s no need for an update. For those who are currently bugged by an issue or two and need help, please email us at [email protected] or post on our Facebook wall and/or Google+ page. Just provide all necessary details like the model of your phone, the version of Android it’s running on, and what you think is the problem with it. Include the behavior of the phone before and after the problem occurred. Troubleshooting: Hi AJ and Mike! AJ, it seems the problem is really with your microSD card or, at least, that’s the cause why the phone is getting warm. It is obvious there are times when the card fails. When it happens, the phone will try to over and over again to detect and read it. That’s where warming enters. Remove your microSD card and observe the phone to see if it still gets warm. If not, try reformatting it to see if the issues gets fixed and if still not, then try putting in a different microSD card just to see if the phone is capable of reading a card without warming up. If it’s not capable of that, then consider having the phone checked or replaced. However, if the phone still gets too warm even without the microSD card, then try to see if it’s app-related or not. Boot the phone in safe mode and observe closely if it gets warm with all third-party apps temporarily disabled. If so, it’s the phone; it’s one of those units that gets too warm without apparent reason at all. Mike, if you’ve researched about the overheating issue with the M9, I know you’ve encountered legit claims from other owners that the phone is actually overheating even if the device is not used extensively. HTC denies it’s device is overheating and Qualcomm said it’s chip isn’t the cause of the problem. The manufacturer, however, rolled out a minor update that was said to fix the issue. Oh well, it throttled the performance of the phone a bit and many say the new firmware takes care of the problem. HTC must be working on something that will take care of this issue permanently but we really don’t know when the fix will come. For those of you who might still be bugged by this problem but haven’t received the update that’s said to address it, turn off the High performance mode in the Developer options. This is one way to throttle the performance of the phone but it helps. Also, turning on the Power saver mode helps but it will limit the phone’s performance and features considerably. Troubleshooting: Hey guys! I know you may have already done this but please make sure the Auto-rotate screen feature is enabled and then, reboot your phone. For minor hardware and firmware glitches, a reboot may be able to fix them. If the problem remained, then reboot the device in safe mode to temporarily disable all third-party apps. While in that state, try to see if the phone still won’t auto-rotate because if so, then the problem could be in the gyroscope or the firmware itself. With that, the next thing you should do (especially if the phone has been auto-rotating before) is to recalibrate the gyroscope. Launch the Help app > tap Hardware misbehaving? > Hardware diagnostics > G-Sensor test. Follow on-screen instructions. After the calibration and the display won’t auto-rotate, perform factory reset. This is to rule out the possibility that it’s a firmware glitch. After the reset and the problem persists, then it’s time you let HTC know about it or your provider. Troubleshooting: Hi Jenny and Mel. There are a lot of factors that may contribute to the energy consumption of your phone but before you go into discovering whether it’s apps or the firmware that has issues, try to feel the temperature of your phone. If it gets so warm even if it’s used extensively, then it’s more of a hardware problem than anything else. Otherwise, try to check what apps are sipping all that juice so fast. Go to Settings > Power > Battery usage so you will have an idea where to start. Apps that use more power will either be disabled or uninstalled. I understand you want to use the phone to its full potential but if it’s important to you to keep your phone powered up until your work is finished for the day, then turn the Power saver mode on. I know you’re handicapping your phone when you do that but you don’t have a choice except having the phone replaced. Oh by the way, you may also want to decrease the Brightness level of the display, turn off syncs, block notifications, and turn off vibration. Problem 1: Hi guys! I have a problem with my new (I mean 2-day old) HTC One M9 phone. It’s just won’t turn on no matter what. I thought the battery’s dead so I charged it; it won’t charge! Is there anything else I can do to turn it on? Problem 2: Hello people. Thank you so much for everything you’re doing for us users. You know my phone just turned off today and it won’t power on…it won’t charge either. So, I think the battery’s just dead that’s why it won’t power on. However, I can’t get it to charge and that’s the problem. Why does a phone like this won’t charge? What do I do? Suggestion: Hello guys! For a phone that won’t charge nor turn on, there’s nothing you can do, actually, except send it in for repair or replacement. So, contact your provider or the retailer where you bought it and have it fixed by their technicians or get replaced with a new unit. Always remember, opening the phone by yourself and tearing the seal will void the warranty. Troubleshooting: Hello Sheila. I don’t know what your service provider is and where you got your phone but to fix this issue, try to enable or turn mobile data. After that, if the problem still persists, call your service provider, ask for the APN settings and let the rep walk you through setting it up on your phone. That’s it! Troubleshooting: Hey, Jan! It’s probably just an app you installed. Boot the phone in safe mode and see if it lags or freezes while in that state. If doesn’t, then find that app that causing the problem and uninstall it. That should do it. However, if the phone still lags or becomes really slow while in safe mode, then reset it! I understand you’ve already setup everything but you really don’t have a choice right now. After the reset and the phone is still slow, have it replaced immediately. Answer: Hello Hayley! Some pre-installed apps can be uninstalled but some just can’t and one way to know which of them can be ditched, go to Settings > Apps and swipe to the All tab. Scroll to and tap the app you wanted to remove. If there’s an Uninstall button, then it can be uninstalled. Otherwise, try to find the Disable button. In this case, the app including its services can’t be uninstalled but can be disabled. Moreover, I don’t know why you want to uninstall the pre-installed apps but there’s another way to somehow “hide” the app so that you won’t see its icon when you open the app drawer. Tap the Home button, then the Apps icon. Touch the icon that shows three dots at the top right and then choose Hide/unhide apps. There will be checkboxes beside the icon of every app, tick the ones hidden and hit Done. You can still show all hidden icons by following the same steps and unchecking them. Answer: Hi Jason! Yes, you can definitely remove Blinkfeed if you don’t like it. Just head to Settings > Personalize > Manage Home screen pages > scroll to Blinkfeed > tap Remove. Bye, bye Blinkfeed! Solution: Hey Joe! Yeah, children today are really kind of busy…with their gadgets, most of the time. But he’s right. One way to make your phone buttery smooth again is to turn off animation scales. There are three of them and you can find them under Developer options. The first thing to do is turn on the Developer options on your phone. Go to Settings > About > Software information > More > tap the Build number seven (7) times. Now, go back to Settings. Find Developer options and tap on it. You can now see Window animation scale, Transition animation scale and Animator duration scale. Just their values to zero (0) and you’ll notice the difference for sure. Answer: Hi Mary! 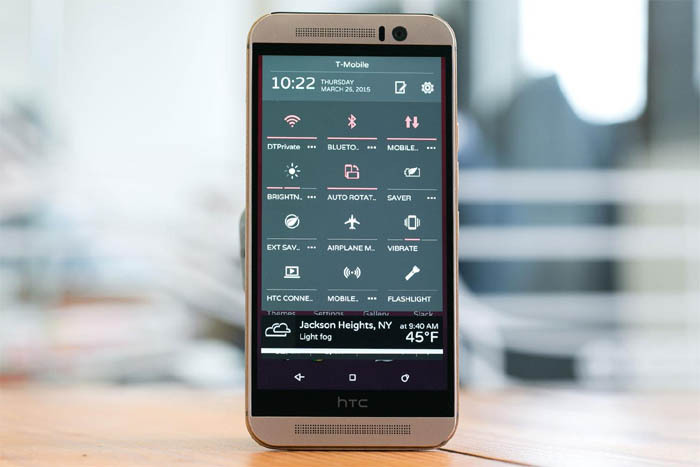 Yes, the new HTC One M9 has the feature called Double-tap to wake up & sleep. Head to Settings > Display & gestures > Motion Launch gestures > and tick Double tap to wake up & sleep feature. With that feature enabled, you can wake your phone screen by simply double-tapping it. You can also put it to sleep by doing the same. Enjoy! We are always open to your problems, questions and suggestions, so feel free to send them at [email protected] We support every Android device available and we are serious in what we do. This is a free service we offer and we won’t charge you a penny for it. But please note that we receive hundreds of emails everyday and it’s impossible for us to respond to every single one of them. But rest assured we read every message we receive. For those whom we’ve helped, please spread the word by sharing our posts to your friends or by simply liking our Facebook and Google+ page or follow us on Twitter. Hello! I’ve a HTC one M9. It got screen damage for a while ago. It turned black. I decidet to buy a whole housing and screen. Today I was working on it. Housing is very bad quality.When I reassembled my M9 I realised that It is starting up to logo and rebooting many times afterwards. And battery is geting wery hot. I tought it may be a new screen is doing this. Disconnected it – the same thing. Connected that damaged one, doing the same. Disassembled and assembled ones again – no luck. If I go in boot mode I can’t use download and recovery mode. If I connect the phone to charger it fals right in the bootmode And if I choose power off from menu, phone is rebooting and going back to bootmode. I’ve got a clue that problem would be in buttons. Disconnected them from mainboard and now, when I connect it to charger it lights up orange diode like it should when phone is charging. Please help me with faultfinding. I would like to know how to check volume and power buttons. I have had a bad problem with my HTC 9 double typing, not only the first letter but any letter, number! Very frustrating. What can I do to solve this? Hi. My M9 has the following problem: if there is a call waiting and I answer to the second call I cannot hear anything.It happened anytime I have a call waiting, meaning that I have to call back anyone is calling during a conversation (call). I made all the usual stuff as …restarting , etc. Can somebody help me ? Ho Ho Ho. My m9 turns off. I sent it for repair and they returned it battered!! They said it was sent to them that way…anyway that’s another story and I got my phone replaced. The same thing happened!! I just thought I would hold the on /off button down. After a minute or so it sprung into life…abnormal reboot. I have reported it but if it happens to you..hold that button down for as long as it takes!! Ya know, most of these answers are of the “too bad” type so what’s the point? My m9 not only eats power andl will not charge most of the time but when I can get it to charge it takes more than 24 hours and this is after doing everything ppl suggest. Ex. : it was off all night and I turned it on now to read 46% charged and during the course of writing this paragraph its down to 40. After reading a few like sites it seems as if consistancy is a production problem as sone owners don’t seem to have these issues. Why on Earth would I exchange it for what might be yet another useless piece of junk? Mtc is giving me my money back and I’m never buying their products again. Lol! There outta be a law, a lemon law for cell phones. My camera is not working properly means the image clarity is not good . is there any settings i need to do before starting a camera for first usage? Hmm. I was thinking this was a pretty good article. Really, for the most part it is.. I must ask though, have you ever seen the inside of an HTC One M9? I got to the point where you said the poopycock about magical tamper seals inside the phone, and then almost invalidated everything you said. So, you haven’t been inside an HTC One M9; that’s obvious, but I must know, who is the joker comedian who told you about this magical tamper seal? Although there is a point in it, if you don’t know what you’re doing, stay out of your phone. It doesn’t take any magical seal to know an amateur was inside! DIY on all you savvy peeps and fear not the magical tamper seal. It’s a falsity that doesn’t exist. hello, I’m Roy, I just would like to ask how to deactivate this annoying haptic vibration during swiping/tapping to wake up my HTC One M9. -Thanks a lot Guys, More power to you!